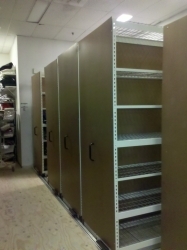 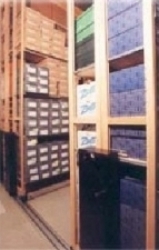 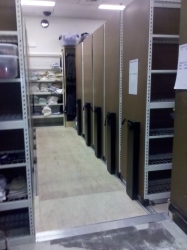 Lundia High Density Stockroom Solutions can DOUBLE your storage! 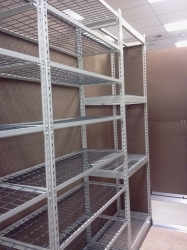 That's right....we can double your storage by eliminating all your aisle spaces down to a single access aisle. 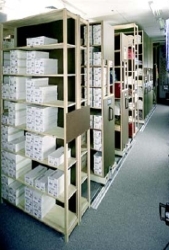 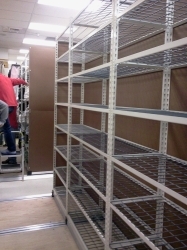 Just like our standard stockroom shelving, our High Density systems are modular and can be made to size to fit your specific room plan or layout. 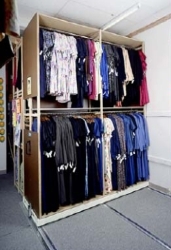 Our solid wood shelving systems or our new wire shelving systems are attached to mobile carriages that roll across your floor on low profile tracks. 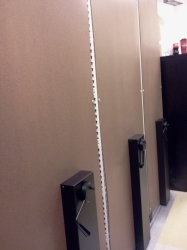 Most systems simply need a push of a handle, but for larger systems we offer mechanical assist units as our example as shown above to the left. 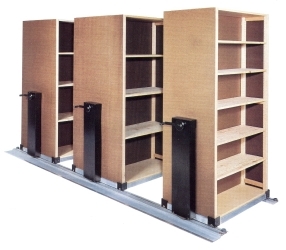 A simple rotation of the handle can move massive amounts of weight with no problem. 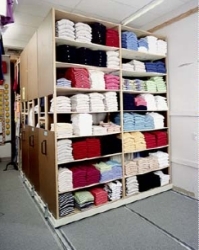 All we need is your basic stockroom measurements and we will provide you a detailed floor plan showing just how much storage you can maximize out of your space.